Ky : Hello, Mr. Sagan. It is very nice to meet you. I am a very big fan of yours. You can combine science with publicity and I am very impressed with it. S :Oh, hello Ky. Nice to meet you too and thank you. Ky : SETI is a very big project nowadays, combined with the search of exoplanets with all the methods for finding the planet that fulfill the Goldilocks criterions. But I think we are too Earth-chauvinist here, imagining all in human perspective? Who knows that extraterrestrial intelligences have the same condition of living with us, with Oxygen and gravity and temperature? S :That is right. In my opinion, we cannot base everything with our perspective as human, living in the Earth. I cannot tell what an extraterrestrial life would look like, knowing the fact that my experience so far, I only have known one evidence of life, the one on Earth. There are also people who have speculated on what are extraterrestrial beings look like, and I am skeptical of their speculations. As I have already written, I do not think life in place other than Earth would look like a reptile, or an insect or a human-even with cosmetic adjustments as green skin, pointy ears and antennae. And if you really insist, I imagine something really different. Ky : Something really different? Yes, I agree with you about that. I have read about your idea of sinkers and floaters on Jupiter and quite enamoured with it. It is that our opinion, blurred by the fact that we are human, should be reconstructed entirely. S :Also remember that the search of exoplanets also begin as searching of possible habitat of human other than the earth. Ky : It is that because the number of inhabitant of our planet that vastly increased and the ability of Earth to sustain all the life continuously decrease acts as the reasons of human’s voyage of conquering the universe. Knowing that the nearest planet, The Earth’s sister Venus, is a planet with boiling lava and Mars with War of The World fantasy and Canals that proven wrong after the advance of telescope, human searching for new place of life in more faraway place. But I think, all the exoplanets that detected and proved so far are light years away from us. Isn’t that too far? S :Remember that our research now will be the base of human research in the future. We do not know now, that maybe someday in the future, Our technology can arrive in the time that human can build space ship that can transport human in years and years of voyage, and in that time, human need place to life other than earth. Ky : Hmm, yes. So far, the kind of life like that, space ship and galactic voyage, can only be imagined in science fiction books and movies. Talking about science fiction movies, the advancement in computer graphic can make all the filmmaker dream comes true, shown by the abundance of science fiction movies nowadays. As far as I see, there are some science-fiction movies that are quite good and there are some that are flat-out wrong. What is your opinion? Do science fiction movies matter or just use that as entertainment. S :I do believe that a movie should be one of a way of educating the audience, other than being entertainment. If they can afford make the science right, why not? Ky : I agree with you. If they can give all of their effort of making the computer graphic looks as realistic as possible, they should have given the same effort of making sure that the scientific aspect in the movie right. The base of all the science-fiction movies, Star Wars, in my opinion is more fantasy than science fiction. There isn’t any explanation about how the technology works, the wrong notion about atmosphere in asteroids, and the infamous parsec as the unit for velocity. I hope that all film can do science justice as some examples, 2001: A Space Odyssey , The Day The Earth Stood Still, or A Beautiful Mind. S :Film producers can also give an unbiased view about the possibility of extraterrestrial life. In the movie Alien, it was needlessly violent. And, why must extraterrestrials be portrayed in such a negative light? But then, I do cheer about the increase of science-fiction theme in media nowadays. One of the great benefits of science fiction is that it can convey bits and pieces, hints and phrases, of knowledge unknown or inaccessible to the reader and viewer. Ky : In science fiction movies, there are some science facts that are right, and some that are wrong. Isn’t that dangerous if the viewer take all the things they know from a movie and take them in face value? Isn’t that dangerous that audience only knows few bits of information from science fiction other than from true science programs? How about your show, Cosmos? 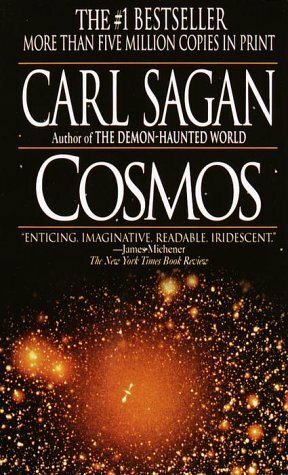 S :Cosmos has received many positive reviews. There are many response, the most commons are from women who said that they understand and like the series, and their interest in science is going up again. I think that it isn’t wrong to write or sprinkle some bit of science in media. I do realize that those are not lecture in Physics or any topics, but I want to evoke curiosity in viewer and reader. I would be happy if my series can teach scientific skepticism to people, in regards of topics like UFO, astrology, and pseudo sciences. Ky : Oh, yes, like the famous Baloney Detection Kit? I think it is a good way to teach people that you cannot just believe anything or any “fact” given to you. I think that the way you write your books as the main factor of the high popularity of your books. I think that the way you write is not as a scientist trying to prove a point with other scientist with hard technical terms, but as a storyteller with the audience. S :I am very happy with this fact. I was writing my books hoping that a lot of people will read it. We tried to write it so that people with no background in science can understand, but do not get the feeling that we looking down on them. In other way, I also want educated people to read my books. Ky : I think that vision is not too farfetched, your series Cosmos, your science fiction story Contact, and all your book has garnered many readers and viewers. Your students like James Pollack and your son, Nick Sagan, all famous in their own merit. I bet there are many students in the science and engineering department look up at you. I think it is a very big achievement, knowing that scientist has been known as locked-up for so long. What is your opinion regarding the popularization of science? S :For me, communicating science with people is normal. After all, when you are in love with something, you want to tell the world. Our world builds on science and technology, but almost nobody understands them. Only a few people know about science and technology and our future is on their hand. For us to make sure that the power of science and technology used properly, we must understand them. Ky : Back again with topic of SETI. I know that the question, ”Is there intelligent life other than on earth?”, and, ”Is all the space endeavour a waste of money knowing condition of the earth now?” are frequently asked question regarding scientist effort of exploring the possibility of the universe. S :We explore the possibility of life in our universe by using radio wave. By using radio telescope, we can communicate with other telescope, if there is any, on a planet of another star that separated by thousands of year. So far, we haven’t found any genuine proof, but we are only at the beginning of the search program. Ky : I myself feel that we should not deny the possibility of life other than on earth existing in the universe. By logic and probability, it is not impossible that there is something out there, either that they are not intelligent life or intelligent but do not have anything to do with us. But as long as there isn’t any evidence, I don’t outright believe it either. S :I know that feeling. If extraterrestrial intelligence is found and proved, people view of the Universe and our life would change forever. But then, if after long and tedious search we find nothing, it would give the special and precious feeling on our life on earth. It should make people preserve earth more. Either way, it is worth the effort. Ky : By using Drake Equation – isn’t Mr. Drake a good friend of yours? – , we can estimate the number of detectable extraterrestrial civilization in our galaxy. I think there are two ways of using that equation, either too pessimistic or too optimistic. Ky : Because all of the numbers are guess, I think that there is no good answer of the equation, either that we get a very small fraction or too big a hope in tens result. The small fraction gives that the only life small exists is ours – so far there is no contrary evidence – and the big result cannot be proved until now. S :The Drake Equation is not a guarantee of the number of life exists in the Universe, but it gives us the plausible approximate number. Also, the other thing is that the equation can connect astrophysics with other disciplines like anthropology and biology. Ky : It is a nice day and very big honor for me to have this pseudo dialogue with you Mr. Sagan. I hope that everybody can also be inspired to develop science and technology. Thank you and see you. S :The same with me. Posted on September 25, 2011, in Reading, Scattering and tagged astronomy, carl sagan, Daejeon, dialogue, essay, ky's exchange, research project. Bookmark the permalink. Leave a comment.